November « 2015 « They Said What? 27 5-star reviews. NO wellness program has that! Buy two now! And if you hate this blog, we guarantee you’ll despise the book. I know it’s not always about me (my ex-wife was quite clear on that point), but I was deeply saddened to see one of the Blues – specifically, Blue Cross of Tennessee — descending into the fabricated-wellness-outcomes abyss. In all fairness, wellness vendors have to lie, since it turns out that achieving savings is mathematically impossible. If they told the truth, they’d all be fired. Even so, Blues should be held to a higher standard for integrity than independent wellness vendors, because lies told by one Blue affect all the others by sullying one of the most readily identified and respected trademarks in America. Before continuing, I do want to emphasize that this isn’t about “the Blues,” which are all independent of one another. It’s specifically about Blue Cross of Tennessee (BCBSTN). By contrast, other Blues – Massachusetts, Rhode Island, Louisiana, Northeast Pennsylvania, Carefirst and South Carolina come to mind (along with the Blue Care Network subsidiary of Blue Cross of Michigan) – have created exemplary outcomes reports. For them, integrity trumps impossibility. Two have even been validated by the Care Innovations Validation Institute, the gold standard in outcomes measurement. Not so BCBSTN. They published a report in which Onlife Health showed some of the best outcomes in wellness history. BCBSTN calls Onlife their “partner” company in this report. However, a corporate lawyer – or BCBSTN itself, in this other press release – would call Onlife a “subsidiary,” for the simple reason that BCBTN owns Onlife. By contrast, you don’t own your partner (though my ex-wife tried). In other words, BCBSTN is “validating” itself, not a partner. Normally “validation” is not performed by the entity being validated any more than an attorney is allowed to render the verdict in a case he or she is arguing. Emergency room visits and inpatient hospital stays were more than 50 percent lower in the moderate exercise group, as well. There were 219.6 ER visits and 59.9 inpatient stays per 1,000 for overweight non-exercisers compared to 73.6 ER visits and 30.1 inpatient stays per 1,000 for overweight moderate exercisers. Let’s consider ER and inpatient separately. About 40-million ER visits a year are specifically caused by injuries, or roughly 126 per 1000 people. This injuries-only figure dwarfs BCBSTN’s all-in ER visit figure of 73.6 per 1000 allegedly achieved by this program. In other words, walking an extra 19 minutes a day not only wiped out every single non-injury-related ER visit, but also about 40% of all injury-related ER visits. Next, let’s consider the inpatient stays. Their 30 stays per 1000 includes birth events, as compared to the more typical figure, which BCBSTN also experienced in the control group, of about 60 per 1000. All birth events combined are about 15 to 20 per 1000. Taking those birth events out of the BCBSTN tally yields 10-15 admissions per 1000, a Nobel Prize-winning figure. And all achieved by walking an extra 19 minutes a day. Another way of looking at it: here are the top 21 admissions categories for Tennesseans insured through their employers. With the exceptions of categories #9 and #10 (morbid obesity and heart attacks), probably not one single admission in any of these categories could have been prevented by walking an extra 19 minutes a day. Even in those two categories, optimistically only a handful of admissions would be prevented by short walks. Contrary to the popular guideline of 10,000 steps a day, employees who took as few as 5,000 steps per day, had annual healthcare costs nearly 20 percent lower than their sedentary counterparts who did not exercise. Spending was $2,038 per member per year (PMPY) for non-exercisers compared to $1,646 PMPY for moderate exercisers. Average claims cost PMPY dropped from $5,712 for non-users to $4,248 for employees who participated in one program and $3,120 for those participating in two programs. Employees engaged in three programs saw their claims cost cut almost in half at $2,892. Looking at BCBST overall, Danny Timblin, president and CEO of Onlife Health, noted, “Over a three-year period of time when we did this study, their claims were essentially flat. And how does “their claims were essentially flat” in the third bullet point reconcile with the massive decline in claims in the second bullet point? Which brings us back to what Blue Cross of Tennessee needs to do next, now that their numbers have self-immolated (along with their ability to define the word “partner”). It seems they have, in the immortal words of the great philosopher Ricky Ricardo, some ‘splainin’ to do. At the very least, perhaps an apology to the Blue Cross Association and to their fellow Blues. And I owe an apology to my ex-wife, who served the purpose of a humorous literary device in this posting, but who in reality is quite charming and lovely, and is inviting us over for Thanksgiving, and all we have to do is bring the pies. But I think BCBSTN will need to give the Association more than a pie or two to make up for this one. Keep in mind the “AngioScreen” is this company’s specialty — the only major screen the Nashville-based Angiology Corporation of America (ACA) offers. In an industry known for harming employees, this makes them the leader, as ACA is the only wellness vendor guaranteed to harm employees on balance, according to the federal government. 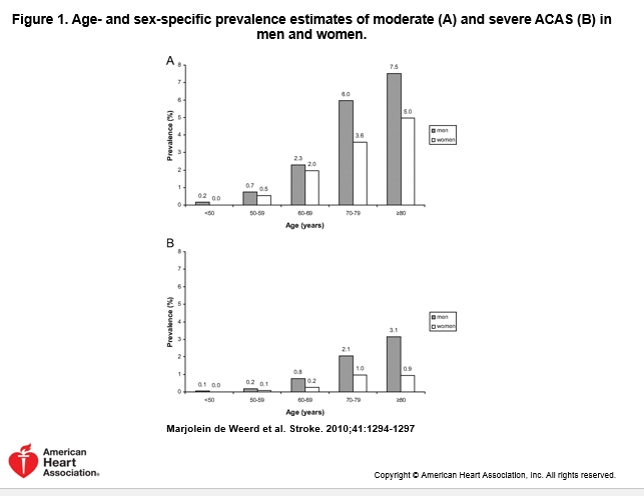 And, by the way, however stupid an idea this screen is for the USPSTF-described “general adult population,” it is stupider still for the <65 employed population, which has far lower incidence rates of stenosis than the seniors, and hence a far higher likelihood of false positives. You might ask: “Is it honest to offer a service you know to be harmful, if way down in your website you disclose that it’s so harmful your customers shouldn’t buy your service in the first place?” Alas, we cannot answer that. That is a question for philosophers, philosopher-kings and philosopher-welders. (1) Would a doctor lose his or her license for offering this test to every adult who comes in the door and billing insurance companies for it? Yes. (2) Are these people disclosing directly to employees that official clinical guidelines recommend against doing this test because they are more likely to be harmed than benefited? No. (3) Do they also make up savings figures? Yes. Specifically they say this “pays-off” in ways that don’t come close to “paying-off”. Additionally, their quality control doesn’t exactly inspire confidence. Speaking of their Medical Advisory Board, despite the fact that AngioScreen is offering exclusively vascular screenings to “prevent your stroke and heart attack,” Dr. Alfred Smauel Callahan, III, M.D. is definitely not one of America’s, or even Nashville’s, leading vascular specialists or cardiologists. How do we know that? As it turns out, he’s not a vascular specialist or cardiologist at all. He’s a neurologist. Those are the guys who treat people after they’ve had a stroke. This choice of a neurologist as their physician leader doesn’t exactly inspire a lot of confidence in AngioScreen’s ability to prevent strokes. Also, there don’t seem to be any other doctors on the medical advisory board, which is “headed” by him. Per the offer on their website, we wrote and called to see if we could “review the curriculum vitaes [sic]” of this alleged board, and got no response. In Angioscreen’s defense, they are not alone in offering harmful screening services. Total Wellness, Star Wellness, HealthFair, and other vendors offer the same screens or — in the case of HealthFair — worse ones. This all brings us back to the question we’ve been asking for years: where are the grownups? Why isn’t there any oversight of the wellness industry? How can vendors and employers be allowed to do things to their employees that doctors would be jailed for doing if they billed patients for them? And how can employees be forced to participate in programs that could injure them, with no business purpose whatsoever? We propose a simple regulation to address those questions: wellness vendors must do no harm. Wellness vendors should be required to disclose the USPSTF rating before they run these screens, and if it isn’t an A or a B for the employee’s age and frequency of screening, employees should be able to opt out without losing their incentive or paying a fine. Update 4:30 PM November 19: I received a call back from Rhonda Small, at the company, who says that they are no longer really in the business of selling screens to employers, but rather mostly to hospitals. Their website, she says, is wrong. This makes better business sense because many hospitals like to offer free or deep-discounted D-rated screens, as we have noted. It is an excellent tool for sucking patients into their revenue stream, which is largely paid for by the patients’ employers or Medicare. She indicated that she would send me curricula vitae (Rhonda, that is the plural, not “curriculum vitaes”, so you might wanna add that to the list of things on your website that are wrong) for the medical advisory board. I will post further updates. 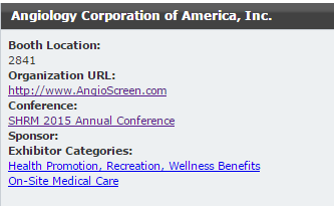 Update 5:00 PM November 19: Apparently AngioScreen’s marketing team has not gotten Rhonda’s message that the company doesn’t market to employers–they just exhibited at the largest human resources conference. It wouldn’t be appropriate to write a typically snarky expose of wellness vendor idiocy/dishonesty this week. Parisians’ wellness program is their trademark joi de vivre, on full display every night. This is especially true on Friday nights, when it seems like every resident and every tourist is enjoying every corner of the City of Light, a city that celebrates humanity’s spirit, accomplishments and aspirations like no other city on earth. Parisians ask why they were targeted. I say, it’s for exactly that reason: what better target for murderous, sub-human barbarians than the pinnacle of civilization? I hope to be in the frame of mind to post again by Friday. Should the Wellness Vendor Oath Be: “First, Do Harm” ? November 12, 2015 7:26 am / 5 Comments on Should the Wellness Vendor Oath Be: “First, Do Harm” ? The Quizzify oath: First, do help. When Thomas Edison said: “We don’t know a millionth of 1% about anything,” he wasn’t talking about the wellness industry, because wellness vendors aren’t that knowledgeable. And much of what they “know” is harmful. Smoking and exercise aside, taking wellness vendors’ advice 10 years ago — during the time wellness was somehow allegedly racking up its famously fictitious 3.27-to-1 ROI by making employees healthier– would have been a very bad idea. PSA tests, annual mammograms for younger women, colonoscopies at 5-year intervals, and EKGs were perfect examples of must-to-avoid screens, even if it meant leaving incentives on the table. And yet even though most wellness vendors (Star Wellness, Bravo Wellness Total Wellness, HealthFair Services and Aetna being notable exceptions) won’t harm employees as much as they did 10 years ago, a lot of mythology still causes a lot of harm today, albeit more subtly. Fact: Have ya looked at your high utilizers and other expenses? 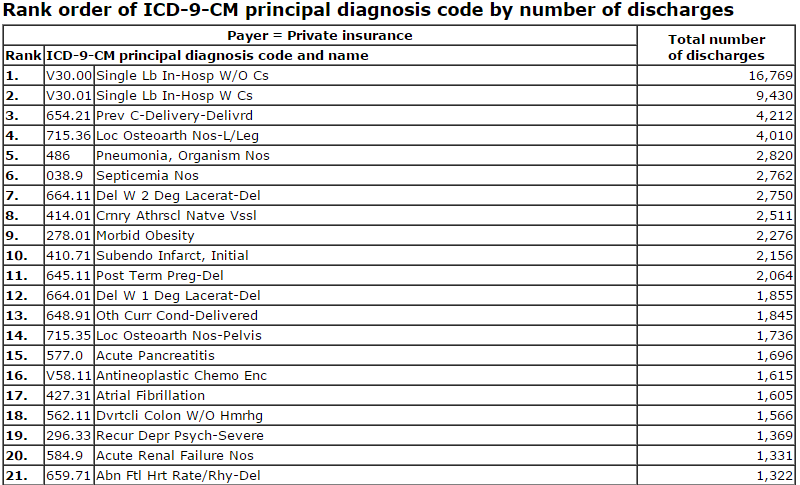 We-can-prevent-75%-of-cost-due-to-chronic-disease is the biggest urban legend in healthcare. We’ve done multiple articles on it — there are too many fallacies to squeeze in here. Though it’s just arithmetic, this is the most harmful fallacy of all, because by causing employers to obsess with overprevention, it spins off all the other fallacies below. Fact: The actual science is far more nuanced. Some people have high BMIs because they are healthy. And belly fat — even at “normal” weights — is riskier than all but the highest BMIs. Further, attaching money to weight loss between weigh-ins creates a binge/crash-diet cycle that is decidedly unhealthy. Fact: No corporate weight loss program has ever saved money. They don’t reduce BMIs, BMIs are the wrong measure (see above), and the link between reducing BMIs and saving money is nonexistent. Fact: Annual screenings are a bad idea for the majority of employees. The head of Optum’s wellness operations, Seth Serxner, just acknowledged this inconvenient truth last week. (He somehow shifted the blame to employers, for stupidly spending too much money on Optum and other vendors. That’s a topic for another post.) The US Preventive Services Task Force has a schedule of screenings that essentially no wellness vendor follows. Because so few biometric screens are recommended for working-age adults by the card-carrying grownups who comprise the USPSTF, following USPSTF guidelines would bankrupt the industry. Fact: Screening guidelines balance harms and benefits, not costs and benefits. The subtlety of the distinction would be lost on most wellness vendors, but it is important. (1) Unless screens are provided free, an employer will lose money even on a screening program done according to guidelines; (2) you are not doing your employees any favors by providing screening “greater than” guidelines, like the Health Fitness Corporation/Nebraska program did. You are simply raising the likelihood of harm. Fact: For wellness vendors, the annual checkup has almost mystical power. Bravo’s CEO Jim Pshock loudly credits checkups with preventing cancer. Wellness vendor bloviating aside, the science is quite settled: employees are more likely to be harmed than benefited by annual checkups. We could keep going — antioxidants are more likely to cause cancer than prevent it. Sitting is not the new smoking. And drinking eight glasses of water a day is good for you only in that you’ll get more exercise going to and from the restroom. Part 3 of the Proof Wellness Doesn’t Work. November 5, 2015 11:11 am / 3 Comments on Part 3 of the Proof Wellness Doesn’t Work. This posting should be read in conjunction with Part 2 of the proof that wellness doesn’t work, which in turn links to Part 1 that shows mathematically wellness can’t work. We explained how this wasn’t the case, and promised that we would post the analysis, so that he wouldn’t have to take our word for it. So here it is. Since $11.3-billion was spent on these admissions in the private-pay population according to the wellness industry’s own HERO Report, these events would have had to rise by at least 60% in order to make the claim that the $7-billion wellness vendor industry broke even by avoiding them. If indeed workplace wellness prevented this huge increase in the privately insured population, one would expect that these very same events would have risen by something similar to 60% in the non-privately insured population–meaning the combined Medicare, Medicaid, and uninsured. As researchers might say, the privately insured population was “exposed” and the remaining US population was “non-exposed.” As wellness spending snowballed, the separation between those two populations’ WSME trendlines should have increased significantly. Instead, we find these populations WSME-as-percent-of-total-admissions also flat-lined, just like the private-pay population. Ironically, to the extent there is a difference, the population without access to workplace wellness trended slightly more favorably in WSME admission rates than the population with access to workplace wellness. 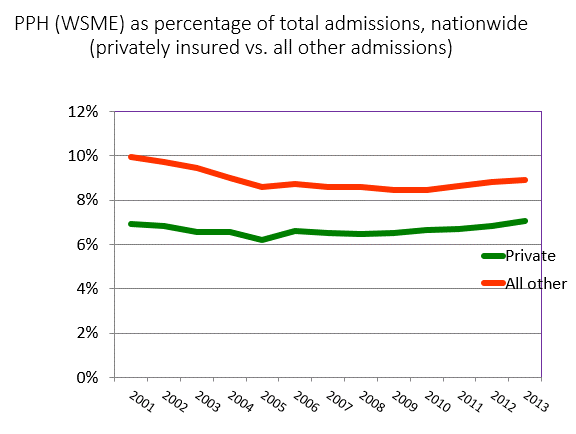 The graph below compares WSMEs — or what the HERO Guidebook refers to as Potentially Preventable Hospitalizations (PPH) — over this century, using the national Healthcare Cost and Utilization Project database. Likewise, the idea that wellness events have indeed fallen on an absolute basis in the employed population due to wellness is also a fallacy. These events have fallen even faster in the population not privately insured.